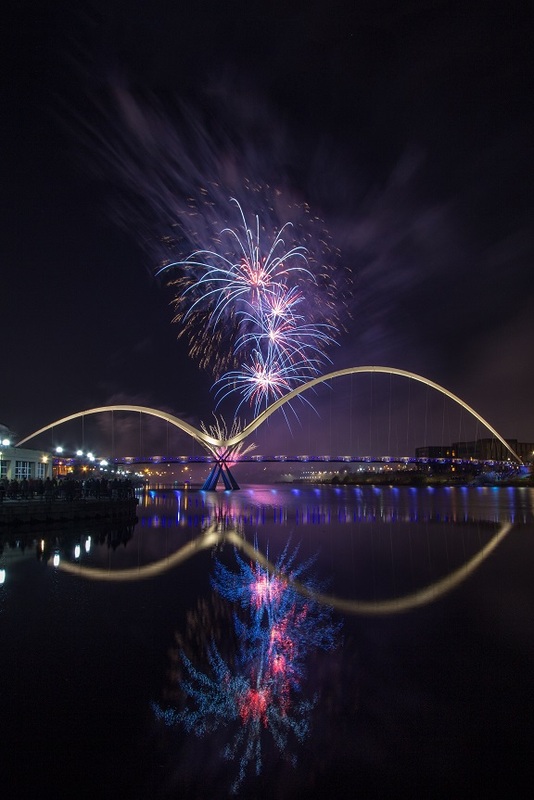 Since I attended the local firework display on Bonfire Night otherwise known as Guy Fawkes I have had a few questions as to how I captured the images so I thought i’d pull together a guide on how to photograph fireworks. 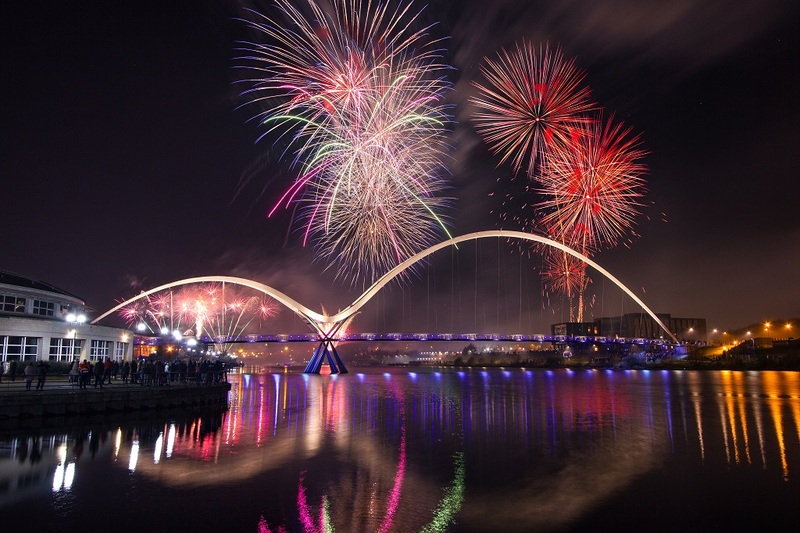 One of the local displays that is always spectacular is at Stockton-on-Tees, it is based around the river and takes in the spectacular Infinity Bridge. 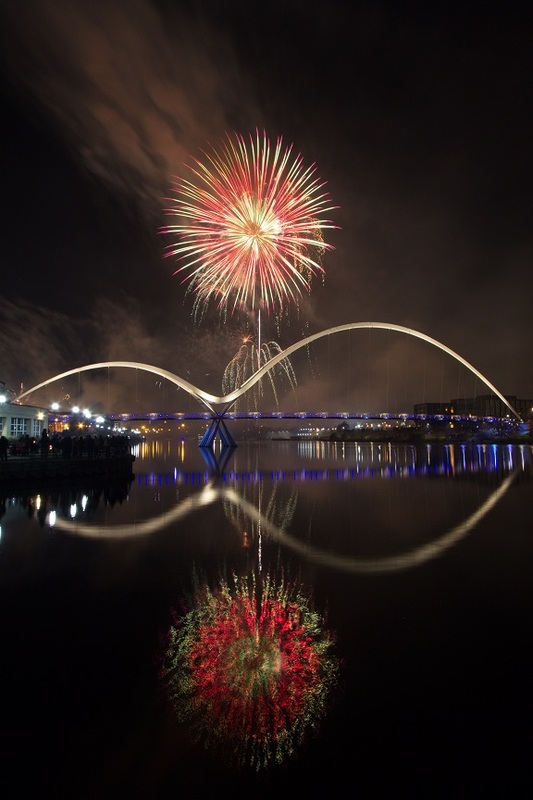 The bridge when captured at night completes the infinity symbol with its reflection; the firework display is perfectly located to get the two together. Use a shutter release cable or the self timer function in your camera. 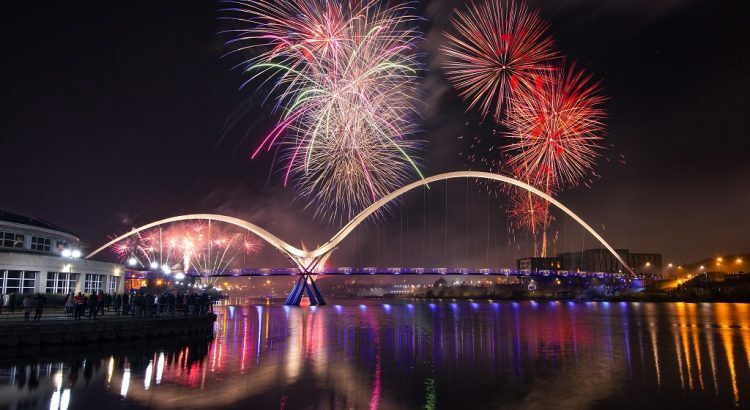 A lens wide enough to capture the scene, bear in mind that fireworks can launch very high in to the sky. 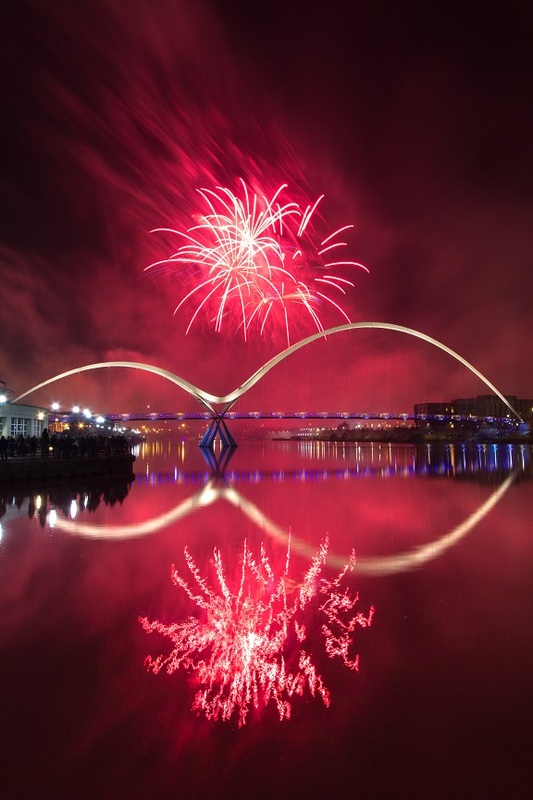 Remember that firework events can be very popular and big crowds are not always great for photography, do some research as to where the fireworks are set off from, the possible compositions and where it is best to stand with an unobstructed view and some foreground interest. Arrive early! The chances are, once you have found that perfect spot you won’t be alone. At my local display some photographers are there jostling for position as much as four hours before the start of the event. Don’t leave it until the last minute and be disappointed! Park somewhere that won’t leave you stuck in traffic afterwards when everybody rushes for the exit! Ensure you are parked pointing the right way for a swift exit and good luck! 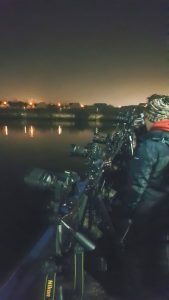 Photographers line up along the river to capture the firework display at Stockton-on-Tees, 5th November 2017. A low ISO of around 200. An aperture of around f/8 to f/11, choose the sharpest aperture for your lens. An exposure time of around 3-5 seconds. Continuous drive setting on camera so that you capture as much of the action as possible. Look for a background that the fireworks will accentuate. Compose the shot before the fireworks start, ensuring to capture a wide enough scene for the full height of the fireworks and the likely angle for any reflections. Focus for the scene, if there is any major object like a bridge focus on that and then set Manual Focus. Fireworks produce a lot of smoke, consider where this may blow through to and how that will impact the shot. 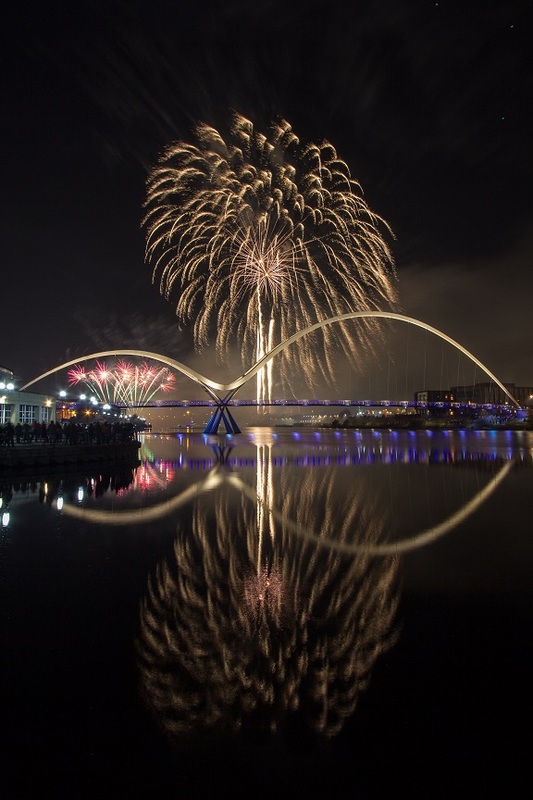 Guy Fawkes / Bonfire Night is typically cold, clear and frosty in the UK being the 5th of November, match that with a calm night and it is perfect for reflections over water. The British weather can however be anything but typical! 2017’s display was perfectly on form though. Use the shutter release cable to take continuous shots in order to capture as much of the firework sequence as possible. 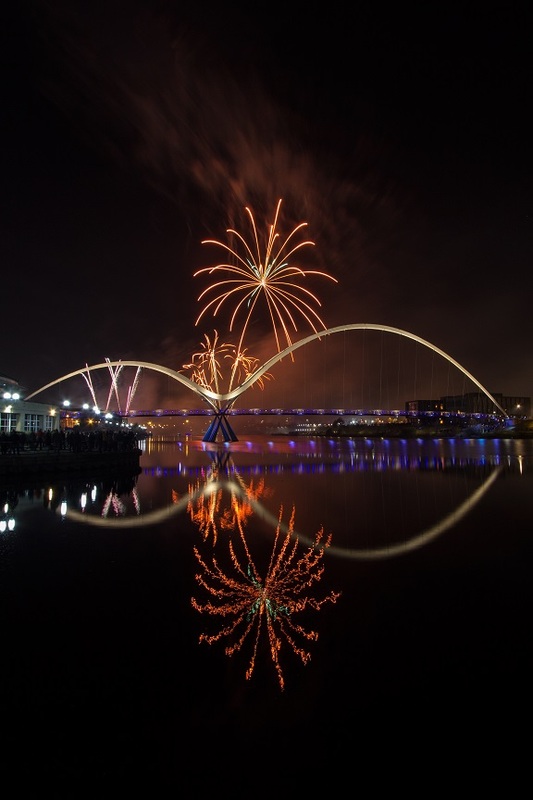 One of my favourite of the night, the fireworks were so crisp and like neon lights, the early evening water was very calm. I love this dark purple scene. One of the great things about fireworks is that you can keep the processing of the shots very simple and almost straight out of camera or you can go to town and have a little fun. I decided to make a composite shot, merging a number of different shots together to bring a little more of the display into a single shot. I processed one photo to use as a background and then blended in a number of other firework photos as layers taking care with the reflections on the water too. A composite image of a couple of different captures merged together. If you found this useful please follow me on Instagram!